Kingdom v Kingdom is where Kingdoms all over Lords Mobile are able to fight each other, as you fight and get kills/wounded you'll gain points and these points will contribute to your Kingdoms overall point count. This guide will cover all the tips and tricks you need to succeed in solo attacking during KvK. This guide was originally posted by PaperPhone on Lords Mobile Forum. Thanks for share and let's get started. Unless your base might is at 100M or more, please do not send out multiple attacks at once. Although this the hard way. During the first KvK, I relocated to another enemy kingdom and sent out multiple attacks to empty out resources from enemy castles efficiently. However, little did I know that someone has been locking their attention on me the whole time. The moment I sent out 5 waves of attacks, someone of similar might ported beside me and tried to catch my returning troops. He succeeded in killing many of my troops and even got my leader. You might be saying that I just have the really bad reaction time, but let me tell you this. The lag during KvK is not something that you should underestimate. So, back to my point. If you send out too many waves of attacks, it's easy and almost causes no damage to the enemy attacker because your troops are not clustered together and will be easily destroyed. Therefore, I suggest sending out only 1 Attack at every one time and hide your remaining troops. As a solo attacker, there are 2 methods that can guarantee the safety of your troops. The first method being sheltering, and the second being set up for a ghost rally. For the benefit of those who don't know what a ghost rally is, it's basically starting an 8-hour rally and then putting your troops in it. The troops cannot be touched by enemies. NEVER deploy your leader in a ghost rally. This is especially important for those with a high troop count because you'll need the leader in your shelter to provide the extra space for troops since only your leader can enter the shelter with your troops. If you have excess troops remaining, you can either deploy them far away, let's say for an hour, or you could set up camps around your castle. This is a really important tip, because during KvK, everyone is your enemy, and you don't want to get caught unguarded. I've had instances where overlords with billions of might relocate beside me, just to Attack my empty castle. All I can say is that they made a wasted trip. Sometimes when I random relocate, I chance upon hives. When I do so, I make sure to get at least a few of them online by scouting everyone to get their notifications running. Once this is done, I pop an anti-scout and Attack a few faraway targets that have no troops but have their leaders. In these attacks, I usually only deploy 10k Fire trebuchet just to break the wall and bring their leader back. Once I start getting leaders, the guildmates of these victims will attempt to hit me to exact revenge, and they think they will succeed since my 'main force' is out attacking. However, they usually end up creating black smoke in my turf, because I only send out siege troops to Attack, and I leave my main troops in my castle. With the anti-scout on, no one will expect this. This is a good way to get free points. Whenever my troops get wounded during KvK, I make sure to not heal them all back up instantly. Instead, I start the healing process and let it run until my first victim arrives. Usually, players will start attacking me once they realize that my might is lower than them. However, right before their Attack hits me, I either speed up or use gems to heal all my troops instantly. This will always surprise your enemies. Works every time. Always change your chat to the world chat channel. During KvK, Low might players always like to post the coordinates of invaders to get higher might players in the kingdom to chase them away. By keeping an eye on the world chat, you're making sure that your location doesn't get leaked. If you do, stop attacking and hide all troops. After you get hit, shelter all your troops immediately. As a solo player, it's easy to get ganged up on during KvK. In order to prevent further losses caused by chain attacks, you'll want to hide your troops after every Attack you receive, so that further incoming attacks will cause no damage to you. Only when you've made sure that your troops are safe, can you then check your hospital and start healing up. I always find myself in a situation where I would be sitting alone in the middle of nowhere with nobody nearby. At times like this, I would post my own coordinates into the world chat just to 'fish' for players. By combining the tactics that I shared above, I can gain easy points whenever someone who underestimates me comes to the party. 8. Always set up camps containing 1 troop around your castle in a plus sign shape to prevent enemies from porting in too close. This will give you a few more seconds of time to react to an incoming Attack. Ps: I'm an F2P player with absolutely $0 spent. 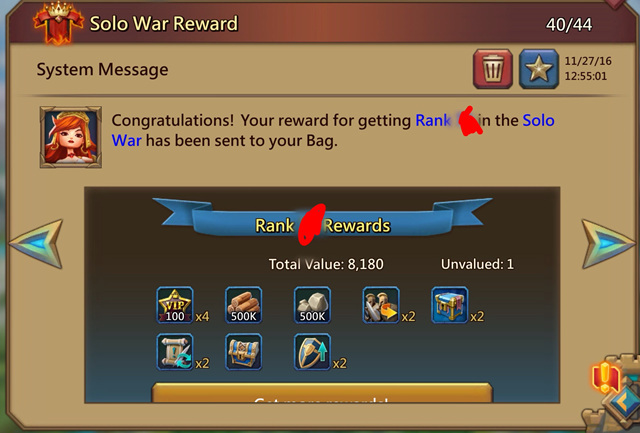 I hope this will motivate the f2p players out there to strive higher. Nothing is impossible. Next Next post: Lords Mobile Event Preview: Witness an Epic Clash of Guilds!